Ron mentioned in his review of Bell’s Brewery that one of the “lesser known” perks of teaching was having holidays off. While many people look at teachers with envy for their summer and holiday vacations, they don’t usually think about the true gems of teaching: snow days. Snow days allow us to not only catch up on grading/planning, but it also allows us to have a drink in the middle of the day. On a day where it is this cold (wind chill around -20!) 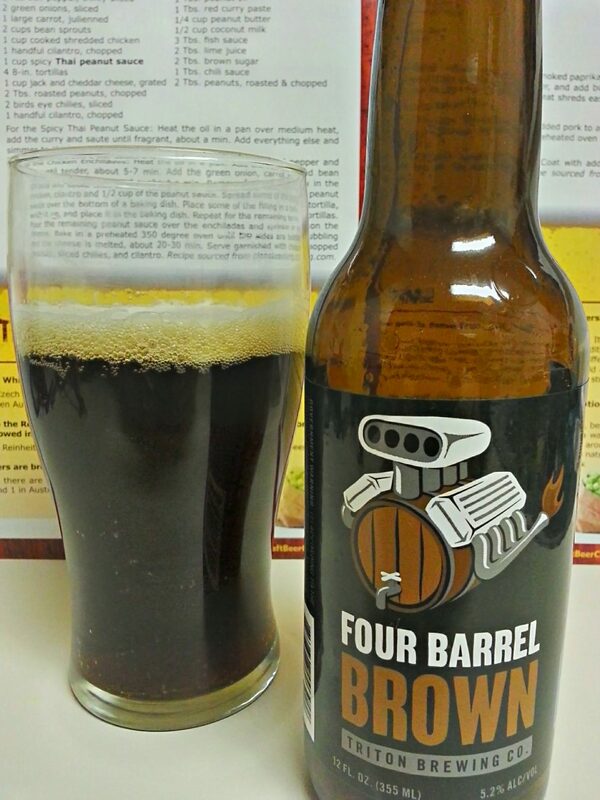 I have to go for something dark, something rich, something warming, so I reached for Four Barrel Brown by Triton Brewing. This is my first taste of a Triton beer, but I’m excited to see what the brewery from Indy has to offer. They describe Four Barrel Brown as having a “very earthy, malty nose with light hop overtones. Nuttiness, caramel and even coffee notes that [they’ve] finished with some light hops for a very nice balance.” That sounds perfect on a day like today, and I can’t way to see if the 2013 Indiana Beer Cup gold medal winner will deliver. Let’s dive in! 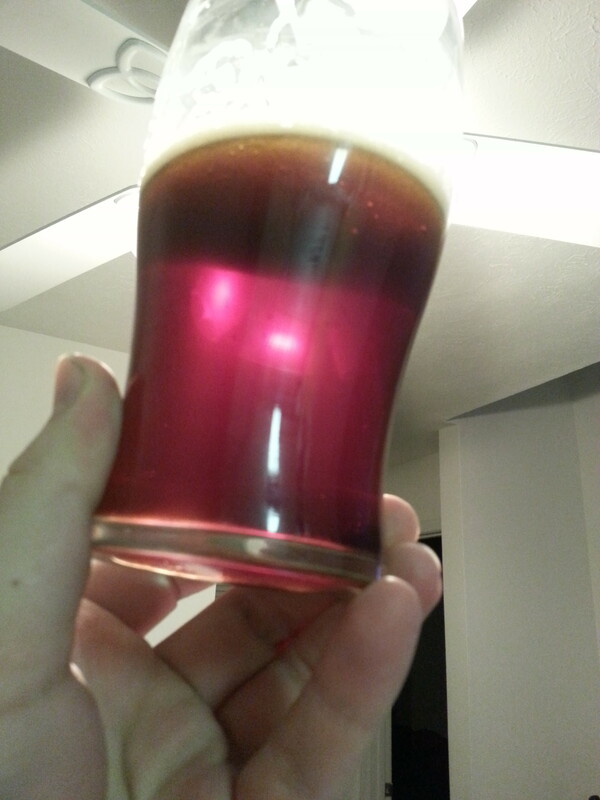 In low light, Four Barrel would appear to be almost black. It is a very dark brown, a deep chestnut color, with a light tan head that lasts for days. The real beauty of this beer shows when it is held up to light. It becomes fairly clear, and the color goes from deep, dark brown to black-cherry red. The carbonation is visible; rapidly rising from the depths of the glass to replenish the lingering, creamy head. I can’t think of many beers that have that strong of a transformation when held at different angles, so it earns some major style points from me. Dark Cherry Red when held to light! YUM! Caramel, toast, and bready malts dominate the aroma. More subtle notes of coffee, chocolate, and booze are also present, thought they can be hard to detect. I’m surprised to smell anything that resembles booze considering this is only 5.2% ABV, but it also has a strong enough sweetness to keep it tempting. There are some great earthy aromas as well, which may come from the style of hop used, but there isn’t a necessarily hoppy aroma to talk about. The first thing I notice is the amount of carbonation. For a brown, I expect there to be a medium to low fizz level, but there is just a lot of bubbles going on here. It made for a great presentation, but probably has an adverse affect on the flavor. It has a pretty thin body, almost water-like if it wasn’t for the high amount of CO2. Just as the aroma indicated, there are a lot of caramel and bread flavors here that fade into some nuttiness and finishes dry and somewhat metallic. It takes a second for that metallic aftertaste to hit, but once it does I want to reach for more beer to wash it out. Booze isn’t present, but surprisingly there is a bit of citrus hop flavor. A little more bitter than I expect from a brown, but it is pretty balanced and goes down easy. I woke up to one of the best phone calls I can receive. I waited all day until I had the time to try this beer, but, unfortunately, I may have gotten myself a bit over-excited. While I wouldn’t call Four Barrel Brown a “bad beer” by any means, it just didn’t wow me. I was looking for something dark, thick, and full of caramel flavor, but was presented with something thin and bitter. The appearance was perfect and the aroma was right on for the style, but I just didn’t love the taste. I’m going to give Four Barrel Brown a 72, C- due to lack of depth, and high levels of carbonation and bitterness. I will say that if you’re new to brown ales it is a good starter beer. Something that is easy to drink and allows for multiple beers, but it just doesn’t deliver in the flavor department for me. If you see this in a bar, order it with a saucy slab of ribs. The caramelization of the meat and smokey flavor would compliment Four Barrel Brown very well.